Who is Stian Adlandsvik--past, present, and future? I come from an island off the west coast of Norway and I started art school in 2001 because I wanted to learn how to draw and paint better. During that time, I started questioning the content of what I was doing. So I picked new content for my work, at that time more or less randomly. It had to do with nature and animals, quite Scandinavian I guess, but it was a way to start experimenting with other techniques and an attempt to establish my works as tools for discussions. After two years I went on to the art academy in Oslo. The Scandinavian in my art turned away from the romantic notion of nature, and over to the unique economic situation Norway was in. I tried to look at this up against the rather small country we are, and explored general questions regarding the image we create of ourselves as Norwegians. In one of my solo shows at the time, I made an exhibition based on a photo of the crew from Apollo 11. They visited Norway some months after they landed on the moon, and in this photo they are seen with their wives outside a small cottage in a rural part of Norway. The suits and high heels are incredibly unpractical in the mountains of Norway, and so, based on the different conspiracy theories that they never landed on the moon, I posted a theory that they never went to Norway and that this was the big hoax. So I remade the whole façade of the cottage as sort of a proof from this photo shoot. Everyone visiting the show could get their picture taken in front of the same cottage as the Apollo crew. Right now I am preparing my first solo exhibition at a gallery here in Oslo called Galleri K. I very much look forward to develop my new works further – right now I feel I have found a very good place to start and that the direction this has taken the last months is something I can work with for a long time to come. How has the idea of the 'machine' influenced your work? As a way of producing sculptures I have always been very interested in the effect that a certain work setup generates. The end result is interesting only because it is the consequence of this particular setup. I see the idea of the machine setup for making work as somehow a metaphor for a bigger machinery that has to do with trade or economy. Machines, in general, are efficiency, power, speed, and you can trust them every single time you hit that button. They are the opposite to the slow emotional human. I like to think of production chains as some sort of machine–stripped of sentiment and emotions. I try to make my own set-up where the parts are set out to do things they cannot do very well, and therefore end up as sad, weird, meaningless. This can involve giving something, like an electrical tool I have used for making another sculpture, a new function that it is somehow unable to hold. You and Lutz Rainer Müller, who you frequently collaborate with, just finished a work called Dis-position. What was the idea behind this work? “Dis-position” is a sculpture made for the Arctic University in Tromsø in Norway. It is standing outside the new science and technology building on campus, where both navigators for ships and airplane pilots are being educated. There is also research on world health being done on impacts of global warming and global emissions with special focus on the northern areas, as well as research on northern light conducted by the physics department. Our aim for this sculpture was in some way to combine these different positions into a public sculpture. Quite instantly we decided that we needed the work to contain light, since Tromsø is very far north. Therefore during winter the sun never rises, and during summer it never sets. It is also located right underneath the northern light belt, which is the reason for having this particular research department: one can understand their unique relationship to light. Further, we thought about the placement of the city. Being very far north and remote, we wanted to add some sort of signifier that said something about how Tromsø relates to the rest of the world. So we combined all this and made a bouquet of light. The work consists of 10 unique lanterns from the cities with the 5 largest airports and the 5 largest container ports in the world, based on 2013 statistics. They are put up so that they point towards the cities they represent and have been oriented parallel to the lanterns in those cities. Additionally the lights turn on and off according to the sunrise and sunset in their places of origin. The work functions as a giant clock. You can actually calculate exactly where you are on the earth based on the angles and positions of the different lanterns. This way we combined the navigation aspects of the shipping and pilot educations, and, at the same time, we visualized the current junctions between geography and the world’s economy, and questioned Tromsø’s position globally. How does your environment shape your art? I try to close up inside my own studio when I work. I need that time and space. I very much like to have a studio with tools and possibilities. However, I have found myself in residencies or similar situations with little or no tools. When I was in Beijing on a two month residency I had to work not only without any tools or workshop, but also without actually understanding very much of what was going on around me due to the language barrier. So I ended up collecting leftovers from construction sites and textiles that used to contain various materials like concrete or filler. I then found a woman that could turn these textiles into classical Chinese lanterns. For me the sculpture that came out of this somehow is a reminder of all the possibilities that a given studio offers and that it is vital to challenge the ways my work gets produced. I always try to remember to question the real reasons for making a work. It is about what the artwork needs, and not what I need. I think my work has developed from having specific stories or anecdotes as a backdrop to them, to becoming more of an investigation into sculpture and materials and how we understand these materials. I think this has been a gradual change and I now see much more of a freedom in the way I am dealing with the works I produce. What has been the favorite work you've created? Convergence is certainly one of the favorites. 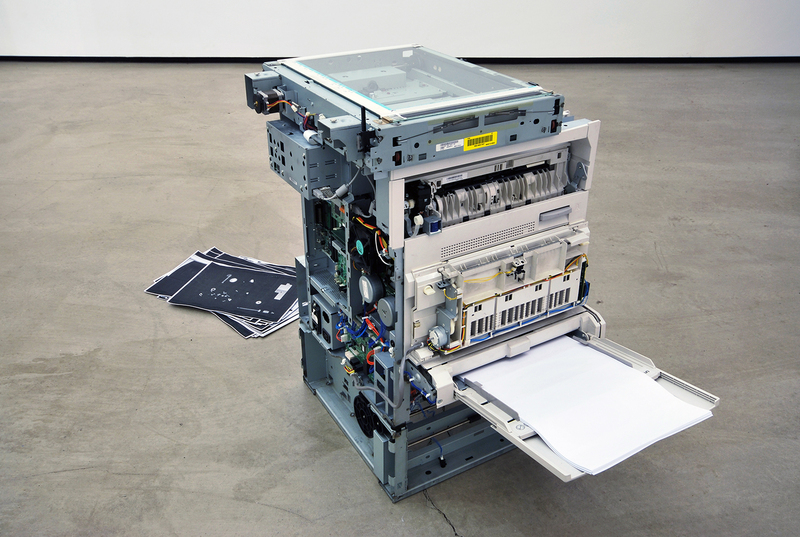 I removed as many parts from the xerox copier as I could until it could not copy anymore, and documented all the parts I removed on the copier itself. Can you tell me a little about your Metal Cloud project from 2010? 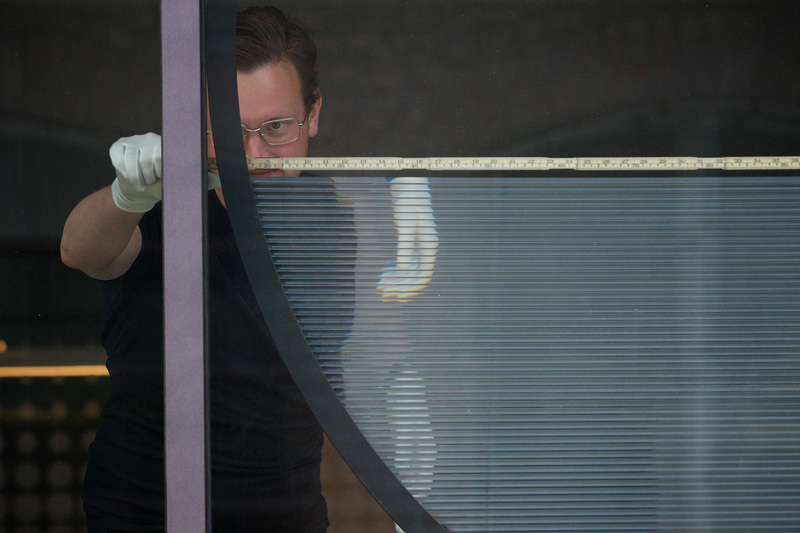 This is a photo series I did as an investigation into material fatigue. 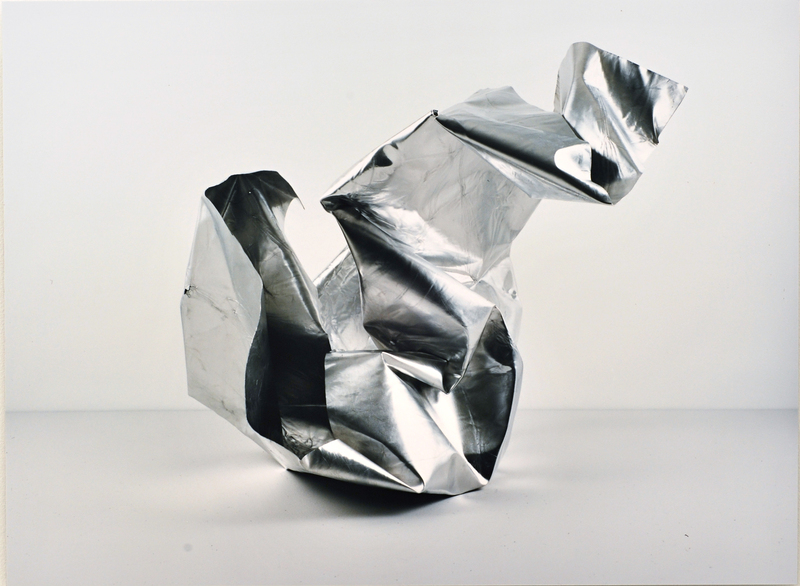 I used the same aluminum sheet to make a total five sculptures, one for each photo. I folded the sheet into a sculptural shape, and it was then documented before it was unfolded and flattened mechanically. The photo series is not only showing how the material decays and gets weaker, but it also documents the different forms this sheet contains–its history. How has other mediums of art shaped your own artwork? Are there any particular artists who you look to for inspiration? Music certainly has played a big role for me as long as I remember. I get huge amounts of confidence in what I do and how I do things by listening to hard punk, or dark Norwegian black metal. On other days, I find smooth pop like Prefab Sprout fantastic, or electro or singer-songwriter stuff. It all fills different purposes and works side by side. I can get very inspired by bands like Einztürtzende Neubauten and their rather radical sound from the 80s and 90s. I have always been very keen on going to Asia. I love the feeling of being thrown into a situation where I have no idea what is happening around me. My first time in Beijing I felt so lost, but also so liberated. Everything was possible, and the complete weirdness that comes out of both being lost in translation never stops to fascinate me. Where do you hope to take your work next? Right now I am so happy to be back in my studio just experimenting with different possibilities of making sculptures and art. I genuinely hope to be able to keep this feeling of belief in my art, and to be able to let my work develop naturally. One year ago I bought a painting from a good friend of mine that in a very painterly way spells out the words “Just say no”. As I saw it I immediately thought that this should be words to wake up to. It is hanging in my bedroom now.